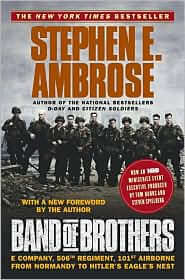 In Band of Brothers, veteran historian Stephen Ambrose tells the story of E Company, 506th Regiment, 101st Airborne – one of the most successful light infantry units to fight in the European theater during World War II. Formed in July 1942 and inactivated in November 1945, “Easy” Company saw its first action when it parachuted into France on the morning of D-Day. It participated in “Operation Market Garden” in Holland, and went on to play a crucial role in the Battle of the Bulge by holding the perimeter around Bastogne. It was also the first company to reach Hitler’s “Eagle’s Nest” in Berchtesgaden, Germany. Over the course of its 3-year service in the field, Easy took 150 percent casualities. It was a company that considered the Purple Heart not a decoration, but a badge of office. With assiduous attention to detail and a compelling style, Ambrose traces the fortunes of the men in this brave unit who fought, bled, went hungry, froze, and died – for their country and for each other. We follow them through training and into combat and onto victory. To quote another reviewer, “In these pages, the reader can vicariously walk with the men of E Company, suffer and laugh with them.” And as we read, we can’t help but fiercely admire them. The company had been born in July 1942 at Toccoa. Its existence essentially came to an end almost exactly three years later… In those three years the men had seen more, endured more, and contributed more than most men can see, endure, or contribute in a lifetime. They thought the Army was boring, unfeeling, and chicken, and they hated it. They found combat to be ugliness, destruction, and death, and hated it. Anything was better than the blood and carnage, the grime and filth, the impossible demands made on the body – anything, that is, except letting down their buddies. They also found in combat the closest brotherhood they ever knew. They found selflessness. They found they could love the other guy in their foxhole more than themselves. They found that in war, men who loved life would give their lives for them. The sacrificial actions of these men – and of soldiers in general – reflect the very essence of John 15:13: “Greater love hath no man than this, that a man lay down his life for his friends.” Such love is rare. Amid the rampant egotism of modern culture, it is even rarer. One of the things I most appreciated about the book is how Ambrose gives the reader the big picture without ever compromising the small one. The account he shares is a very personal one, showcasing ordinary guys in extraordinary situations. We never lose sight of the fact that, however big the war was, the men who fought it were real men – not just pieces on a chess board being moved from place to place by generals and statesmen. 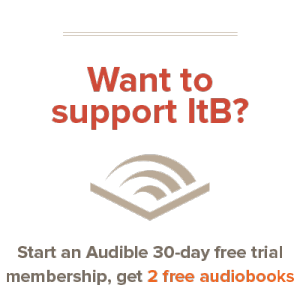 For those concerned about content, I should note that – compared to most war sagas – Band of Brothers is a surprisingly tame. That said, it’s still not a book I’d recommend to readers under 16 years of age. Ambrose touches upon some mature themes, and there’s some foul language (in one instance, quite strong) scattered throughout. Suffice it to say, I loved Band of Brothers. And when I tell you to go read this book, I mean, go read this book. Don’t just add it to your wish list and hope you’ll get to it sometime: seek it out and get your hands on a copy the next time you’re in the library or the bookstore. It’s a story of honor and sacrifice and courage in the face of unspeakable odds. It’s a story of great men, of heroes. It’s a story simply too powerful to be missed. Sounds like a very, very interesting book, Corey – thanks for sharing!